West of N.H. Route 135 on South Lancaster Road west of Lancaster Village spanning the Connecticut River between Lancaster, N.H. and Lunenburg, Vt. The bridge is 266'3" long with clear spans of 127'4" and 126'0". It has an overall width of 20'6" with a roadway width of 14'5", and a maximum vertical clearance of 13'3". It is posted for six tons. Towns of Lancaster, N.H. and Lunenburg, VT. The first bridge at this site was constructed in the 1860s or 70s to connect the towns Lancaster and Lunenburg. The owner, Union Bridge Company, operated it as a toll bridge until it was destroyed by a log jam in 1908. Ferry service connected the two communities until a new bridge was built in 1911. Each town contributed $2,500. The remaining $1,678 was raised by subscription. The timber for the bridge was precut and assembled at the site. In 1969, a truck loaded with highway salt dropped through the deck and landed on the ice below. The front of the truck hooked on a steel rod in the bridge while rear rested on the ice. The truck was raised, disengaged from the bridge, and lowered to the ice. It was quickly dragged away from the salt weakened area, turned upright and loaded onto a flatbed on the Vermont side of the river. The bridge was closed on July 5, 1983 for twelve weeks to allow rehabilitation by the state of New Hampshire at a cost of $133,000. Funding came from the towns of Lancaster and Lunenburg, the states of New Hampshire and Vermont, and a federal Historic Preservation Fund matching grant from the National Park Service of the U.S. Department of the Interior through the New Hampshire Division of Historical Resources. The rededication of the bridge took place on November 23, 1983. 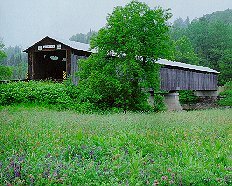 The Mt.Orne Bridge is listed on the National Register of Historic Places.